Employers intuitively and practically understand the need for structure in the workplace. Structure provides the roles, rules, and plans to achieve the outcomes desired by a business or organization. Too often, however, the structure becomes a control mechanism instead of a guide for individual and organizational success. When this occurs, structure becomes counterproductive and an impediment to creative problem-solving. People need structure as a guidepost for their efforts in the workplace. 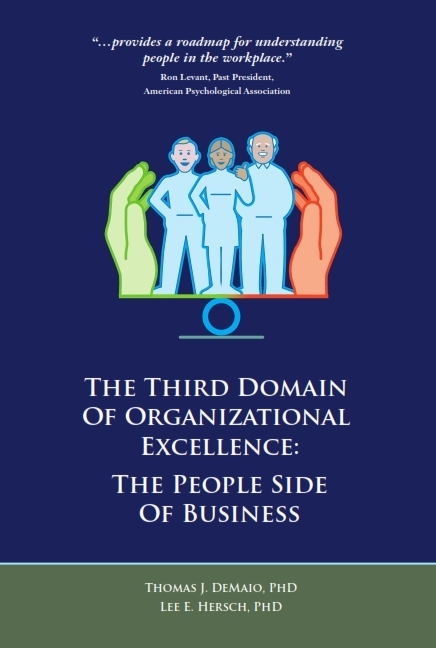 They need a framework for operating in relation to one another and toward organizational goals. The key to operating a useful, healthy structure is in not letting the structure take over and ruling what people do. Structure works best when it focuses more on defining work outcomes instead of work behaviors. Workers want to understand how their work product contributes to organizational success, not every detail of how they are supposed to make that contribution. This focus on the outcome is how structure can exist while still allowing employees an opportunity for autonomy and mastery in their work. The focus on outcomes can help workers maintain the creativity and flexibility needed to master their jobs, find efficiencies, and be part of the team. I saw structure become a problem when I was consulting to a group home system. The system had built an elaborate set of procedures and rules for the staff and the troubled kids. If the kids broke enough of the rules, there were clear sanctions and they were eventually removed from the home. While the system was there to work with “troubled kids,” over time the rules took over and the kids failed at an alarming rate. The director was clear: “We have a set of rules that need to be followed.” Unfortunately those rules became more important than the creative challenge of helping kids adjust, heal, and become productive members of the community. Don’t get me wrong. The rules were needed. But they got in the way of real success. The enforcement of the rules became the project. In the work environment, people can use the structure to help them produce products or provide organizational service in an efficient manner. But when the rules become more important than the actual product, then it is time to revisit the rules. Safety and security in the workplace is usually discussed in terms of the emotional support and protection provided to employees. But there is another component to safety and security often overlooked. People feel safer and more secure when there are clear rules and expectations for performance; that is, when there is a healthy structure. Healthy structure is about clear rules, roles, rewards, and consequences. Work is a place where employees go to perform a job. They need to know what needs to be accomplished, and how their work integrates with the overall production of the organization. Without structure – think the boring stuff like policies and procedures – people will be hesitant, unsure, and worried about judgment of their work. Rules provide a framework for guiding a person’s sense of how to operate in the environment. Without a definition of needed organizational outcomes, people have no way to feel successful, accomplished, or motivated for hard work. Goals provide the essential measure for workers to compare their performance and to know that they have done a good job. One trick to having organizational structure succeed is to have employees participate in building, or modifying, their own structure. It keeps them from feeling controlled and managed in a very negative way. Participation also helps make the structure relevant and efficient for achieving employee outcomes. And, when workers participate, they are more likely to follow and enforce the structure in their small work group. It cuts down on refusals and rebellion, keeping people within safe and productive parameters. Safety and security is achieved through communal buy-in of the structure. When workers agree that the fundamental structures, like pay policies and organizational procedures, are fair and reasonable, they will maintain a safe and secure work culture. The few people who behave counterproductively will be contained and corrected by the vast majority who respect the structure. When I was consulting to a facility for troubled kids, a counselor was asked how he was so successful in getting the kids to listen to and obey him. Mickey replied, “You govern by the consent of the governed.” After we finished laughing, we agreed it was too true. Don’t forget, it is the same in your organization, and it makes for a safe and secure environment. Employees seek to achieve mastery at work. They want to master their jobs and feel a sense of accomplishment. It makes for happy, satisfied, and successful employees. Similarly, people want mastery in their personal and family lives. When people are not able to manage their personal lives they get funky: they are anxious, unhappy, and distracted from work. Organizations are smart to pay attention to work/life balance issues. They need to be careful about taking advantage of their employees and pushing them to their limits, especially in a very lean economy. Far too often people will just go along with trying to meet the demands of their jobs…until they break. They break by getting tired, unhappy, and disgruntled. You may not know it until they leave for another job. Some of the best employees are the ones who will surprise you and suddenly be gone. I recently consulted with one who wanted help conveying to her employer that she was struggling. As a parent with a young child, she was upset about the required travel, about the tasks piling up on her desk, and about the pushy atmosphere at the job. We made a plan for her to tell the boss about her issues with travel. She was not refusing the travel, just hoping it would be slightly reduced. She explained that the erratic hours and workload were difficult for planning child care and family schedules. Her boss heard her, expressed his regrets and made comments about the pressures facing a company that had recently been sold. Hearing that there was no concrete plan to help her manage, she began looking for another job. With her competence she found a new job that actually paid better and where the company expressed a commitment to employee time protection. When she submitted her resignation, her current employer acted surprised and offered to nearly match the new salary. Without hesitation she turned them down. It is a common tale, part of the reason that employee satisfaction rates run about 45% in America. Work/life balance isn’t just a good thing to do, it is critical to maintaining employees in your organization. Encourage your employees to tell you how they are fairing with their work/life balance, or suffer a higher turnover rate. It is not really a choice. A recurring problem I run into as a business management consultant is the organization’s management structure. Too many organizations still rely on an old hierarchical model; you know, where six to ten people report to a supervisor. Each person works under a manager/supervisor who monitors their work, coaches their efforts, and evaluates the results. A few years ago I was asked to consult with a service organization which had three supervisors each overseeing the work of eight workers, all with very similar jobs. Each group had its strengths and weaknesses. One group was superb at the service provision, and one was great with their paperwork. Another was reacting to its supervisor. The director of the organization was feverishly supervising the supervisors in the hopes that they would all work effectively. What could be wrong with this model? It was painfully obvious that each group operated as a function of its leader. Because hierarchical management structures are top-down, they transmit the strengths and weaknesses of their leader directly to the supervisees. There is no buffer, very little cross pollination, and the situation is ripe for personality conflicts. In hierarchical organizations each person becomes narrowly focused on their job. Their goal is to succeed at the job as defined by their boss. They don’t feel a part of a larger mission, they are not connected to one another, and they are less likely to contribute to improving the overall service provision by the organization. My consultation goal became turning the management group into a team. As the management group began working together, they rediscovered their respect for one another by virtue of their unique strengths. Previously seen as an obsessive, one supervisor took on the task of leading the others in strategies for getting the necessary paper work done. One supervisor led discussions about the nature of supervision and the quality of service provision. They all worked to support their weaker colleague. When people aren’t in teams, there is very little shared learning. The learning is limited to the skills of the leader/manager. Any diversity that is present in the group is left unused and unappreciated. There is too little safety and mutual support. My consultation with this group tied the strengths of each team member into a unified whole. By doing so they began to grow and learn from one another in ways they had not previously experienced. In doing so they agreed to turn their respective groups of supervisees into teams. When those teams began to function the organization moved to a whole new level of growth and development. One implication of a family-like work environment is that, just like in a family, you want your young ones to learn, grow, and become self-sufficient. Believing in continuous growth of employees not only leads to more “training,” but it leads to greater levels of autonomy, ownership of the work, and more sophisticated performance. You facilitate employee mastery by sending the message that you believe in your employees: that they are viewed as grown-ups, as wanting to do a great job, and wanting the organization to succeed. This fosters the “less management” approach to leading them; one where you can spend your energy getting behind people instead of controlling or correcting them. In turn, workers move on to measure their success by doing the job well and by contributing; not by the approval or disapproval of their boss. What you want is independent thinking by your team members. Anything other than that can produce sycophants who repeat back what they think is expected. No creativity, no innovative productivity, and very little job satisfaction. Teaming itself fosters growth and autonomy. Since team members view one another as peers, they are more apt to contribute, to self correct, and to remind one another of outcome goals. Team members feel that the collective wisdom is in them, not the supervisor. It means they are responsible for finding the answers. Essential to supporting the move to autonomy and employee mastery is emotional safety. People can think more creatively when they are not so worried that any mistake will get them in trouble. As an organization makes it safe to take on a challenge and the risk of failing, more and more of the staff seek opportunities for growth. In fact, recent research in neuroscience only underscores this point. When people feel safe and seek growth, their brain releases neurotransmitters that improve brain plasticity and produce a sense of well-being. When there is no safety and people do only what they know, these neurotransmitters and not released, nothing changes, and they are less happy. Less Management Equals More Success? In my last post I discussed the work of Teresa Amabile and Steven Kramer. Their research indicates that worker’s well-being depends on a manager’s ability and willingness to facilitate accomplishments by removing obstacles, providing help, and acknowledging strong effort. They show that the most important way to engage people at work is to support them making progress in meaningful work. This is the research and it provides direction for mangers. But what does it mean? It means more than that employees want to succeed at a task, it means that they want to achieve mastery. People instinctively want to do tasks and do them well. We are hard-wired to take on puzzles and to solve them. With such wiring people instinctively feel good about themselves when they are mastering their work. The good feeling also attaches itself to the organization that gave them the opportunity to succeed. So my view of the work of management is to set up systems that support people, structure the system to measure organizational success, and then get out of the way. Do less “management” of your employees. Whenever managers are “managing” people they are getting in the way of creativity, worker ownership, teaming, and high performance. It is what Daniel Pink talked about in his book, Drive. Managers ought to get out of the management business and find ways to engage their employees. The keys to a successful company, at least one where there is thinking involved, are in employees gaining increased amounts of AUTONOMY, MASTERY, and PURPOSE. When people take ownership of their work you don’t have to “manage” them. You cheer them on as they achieve the goals of the organization. People WANT to do it and it makes them feel good. The work of Amabile and Kramer, as well as the research reported by Pink, coalesce into powerful proof that people want mastery. I will talk more about mastery in the coming posts. It is a funny thing that people can’t make themselves go to sleep. What people actually do is set the right conditions for sleeping. You know: get comfortable, go to bed at the same time, turn off the lights, go to the bathroom, and don’t think about work. And then, it happens. You can’t force it and you can’t manage it. You just set the right conditions and it happens. Yes, employees bring a family lens to seeing others in the workplace. One of the most important ways to utilize the positive aspect of this human dynamic is to see the critical value in team-building. Team-building is a fulcrum around which you can negate family projections, build mutual support, and develop a positive culture in your organization. People are naturally comfortable in teams because being in one feels like being in a family. In teams people naturally support one another. They want to make the small group successful because they know all the members, almost as siblings. Helping other team members translates directly back into success in one’s own work. In teams people give and take feedback much more comfortably. People will hear feedback from team members that they can’t or won’t hear from a parent figure. From parent figures feedback can sound pedantic, insulting, or intimidating. The feedback in a team works both for training and for corrective purposes. Teams can also be better at self correcting. Because team members tend to own the work product, they are more invested in letting others know when there is a problem. “Your” behavior reflects on me and I won’t stand for you ruining my effort. Employees tend to build on the strengths of the team members. Team members show each other relative strengths. More than an opportunity to learn from one another, people rely on the most skilled person to lead an area of teamwork. For example, teams usually have a member most technically skilled, a member more interpersonally savvy, and a member more interested in details. Each of these persons finds a niche that has the team function overall on the best talents. When done right, teams become all for one and one for all. This is the camaraderie that creates togetherness, cohesion, and high production. It also creates better buy-in to the mission of the organization. Teams are a key to cultural stability and improvement. As people share the knowledge and responsibility to accomplish goals they learn from one another and they embody that knowledge. When members change, the team passes on the tradition of the team in a very effective manner. You don’t want to miss out on building teams as a way to creating a comfortable and successful work environment for your employees. Need New Year’s Revolutions? Try an executive coach.